This vast compilation of printable worksheets in vertical and horizontal formats exclusively focuses on 2-digit subtraction that involves regrouping. Teachers and home tutors may employ this excellent teaching resource for students of Grade 2 and above. Use the various download options to access all PDF files under this topic. 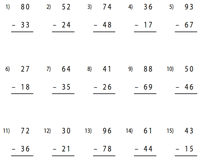 This set of horizontal and column worksheets contains 2-digit subtraction problems with regrouping (borrowing). 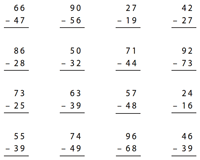 Help young learners brush up on their subtraction regrouping skills with worksheets that comprise 15 problems per page. Use this array of worksheets to test or increase a student's proficiency in the borrowing concept. 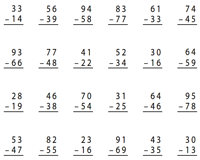 Each worksheet contains 25 subtraction problems. Knowledge without practice makes but half an artist... Well, in this case, half a mathematician! So, go ahead and boost your child's confidence in the concept of regrouping subtraction. 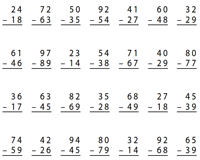 Fifty 2-digit subtraction problems are featured in each section. Well begun is half done - Aristotle. These worksheets are sure to further improve a student's skill in the borrowing concept. Use a stopwatch and watch them excel at solving these worksheets that contain 75 problems per page! 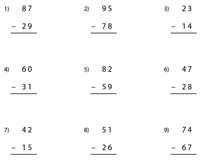 Test your child's understanding of the take away concept with this set of 2-digit subtraction drill worksheets that feature 100 problems per page. Make use of the answer key to verify their responses.